Bootmii public beta 6 as IOS, 2010 Wii v4.3E: Reset, Power and Eject are not "rewired". I just installed Bootmii as an IOS (no choice) on a PAL 2010 Wii (System menu 4.3). I don't have a GC controller, and the console buttons have not been hijacked by Bootmii. Reset and Power still reset and turn off the console, and Eject ejects disks. I've seen that a similar issue existed in 2009 and had been patched. see bug 72 and bug 95. Regression? Is there something I can do, short of buying a GC controller? Re: Bootmii public beta 6 as IOS, 2010 Wii v4.3E: Reset, Power and Eject are not "rewired". Not a regression - in those bug reports the power and reset buttons did nothing at all (the eject button always attempts to eject a disc, there's no way around that). If you do not see a screen like that one, you are not in BootMii. 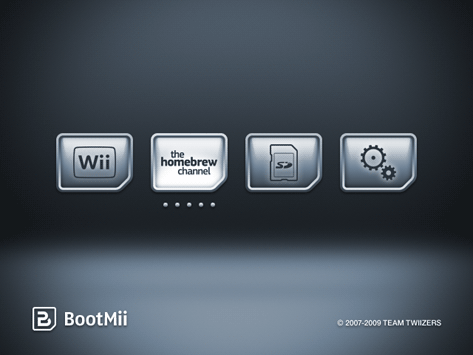 To load BootMii/IOS, run Homebrew Channel, press Home button and select "Launch BootMii".